Mobile devices are gaining importance in the enterprise at a tremendous rate. With the increasing number of smart phone users, applications and operating system versions available, business owners are facing new and complex mobility management challenges. Accessing corporate resources from a mobile device can introduce a significant threat to corporate security. 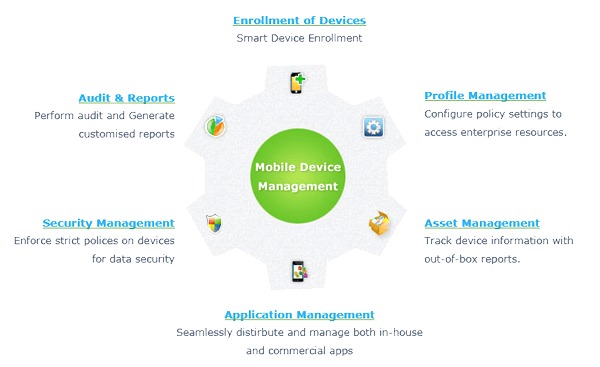 Swash Mobile Device Management enables businesses to face challenges involved with mobility by providing a user friendly & efficient view to manage all devices from a centralized & more secure admin location. Our Mobility solution helps our clients to enroll devices in their enterprise environment very quickly, configure and update device settings with a more secure manner. With Swash, you can manage a diverse fleet of Android, iOS, BlackBerry, Symbian, Windows devices by a single click.